Once in a while, there would always be someone to break the path and set a new course or trend. If it succeeded, it gives hope to other such aspirants. Sankalp, who directed Ghazi, an underwater drama involving submarine with Rana Daggubati is one such an example for others to look up to. He directed one of the first of its kind cinema in the Indian film industry and succeeded very well in that attempt. With such a path-breaking and milestone as his debut film, he is bound to get a lot of opportunities. 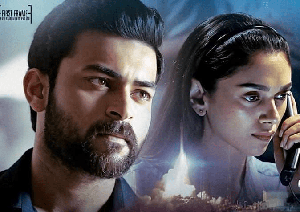 He once again coming up with a new kind of film in the name of Anthariksham which has Varun Tej, Aditi Rao Hydari and Lavanya Tripati in the lead roles, which is being produced by First frame entertainments. Let’s see how it works on us. The story of Anthariksham is good and new to Telugu films. The screenplay is okay and dialogues are good. Songs composed by Prasanth Vihari are nice. He did good work in composing background score. Cinematography by Gnanasekar is superb. His visuals complemented the visual effects well. Editing is good. The art department has done fantastic work. Production values of First frame entertainments are grand. 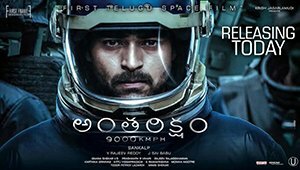 Anthariksham is a film which has space travel which is affected by personal intentions and aspirations of the astronauts. This concept itself is a new one to the Telugu films and it is a rare movie in Indian cinema which doesn’t have enough space dramas. 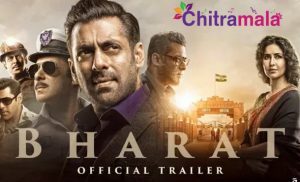 Director Sankalp, who entertained and gave a unique thriller in the name of Ghazi has failed to live up to that curiosity of audience to see a new kind of cinema with Anthariksham. The whole first half goes into setting up the characters and their backstories to make the smooth flow of the second half. The second half starts on a good note and goes into the logicless mode. Surely, it is not what an audience expects. This half is stretched a lot by creating some conflicts to make the audience invested throughout but it’s not the case with the audience. The scenes between Aditi Rao and her grandmother are written over dramatically. To sum up, Anthariksham is definitely a new film to experience on screen but it has its flaws to outshine that new kind of experience.